Here was the agenda for the meeting. 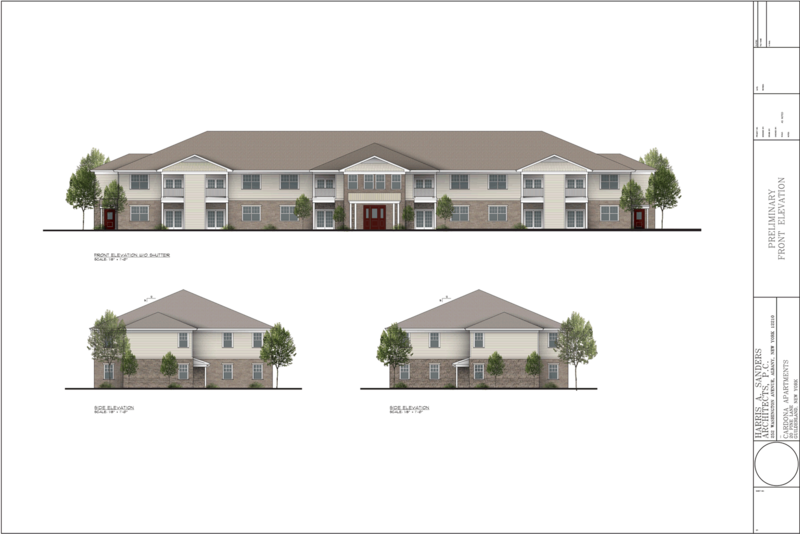 The Cardona Development Group's proposal to build a two-story, 24-unit apartment building on Pine Lane -- off Rapp Road and Washington Ave Extension -- was back up before the board for the fourth time after last month's vote was postponed at the last second. Engineer Dan Hershberg was again repping the project, and he provided a quick recap along with a few small updates regarding issues such as stormwater and lighting. The issued that prompted the delay was a quirk of Pine Lane itself: Though maintained by the city of Albany, the street is not actually owned by the city. The lot lines for the properties along Pine Lane run right to the center line of the street, meaning it's privately owned across multiple parcels. And that complicates any effort to, say, install sidewalks or street lighting. Despite last month's delay in an attempt to get everyone moving in the same direction on the street issue, it was still unresolved as of the meeting. 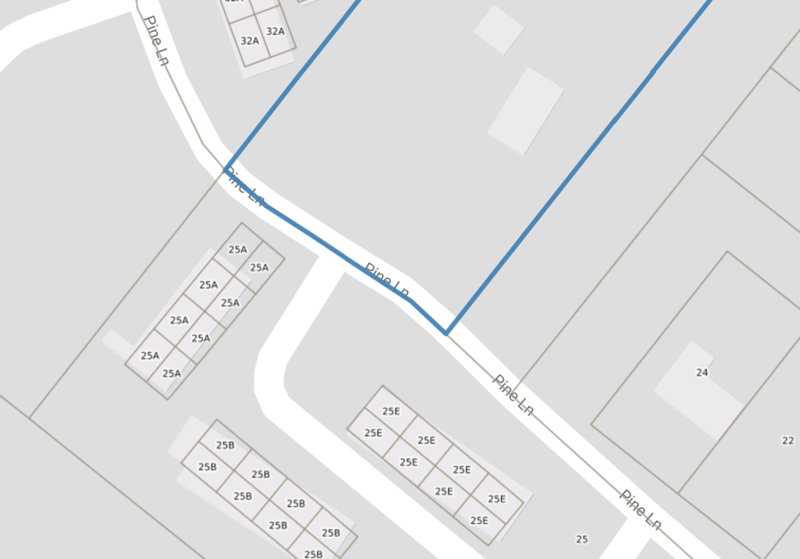 During public comments, Common Council member Michael O'Brien -- whose ward includes the street -- called attention to the street ownership issue, and pointed to a recent effort by the city to officially claim ownership of Birch Hill Road on the very northern edge of the city. Whatever happens with the apartment project, O'Brien said the city should take on the street ownership issue. "This street desperately needs sidewalks and it desperately needs lighting," he said. "I am willing to work to facilitate this as much as possible." Ahead of the board vote, chair Al DeSalvo took a minute to explain why he would be voting yes. He said he appreciated Michael O'Brien's advocacy for resolving the street ownership issue, but it was ultimately a topic outside the planning board's authority. He said the development team had addressed other issues related to the project, including stormwater. And the project fits the zoning. "Almost all the concerns that have been articulated have been met," he said. A screengrab from the Search Albany property viewer -- see how the lot lines run through the middle of the street. So about that street ownership issue: After the meeting, Marisa Franchini -- the city's attorney -- explained that Birch Hill Road and Pine Lane differ in some important aspects for addressing the city ownership issue. 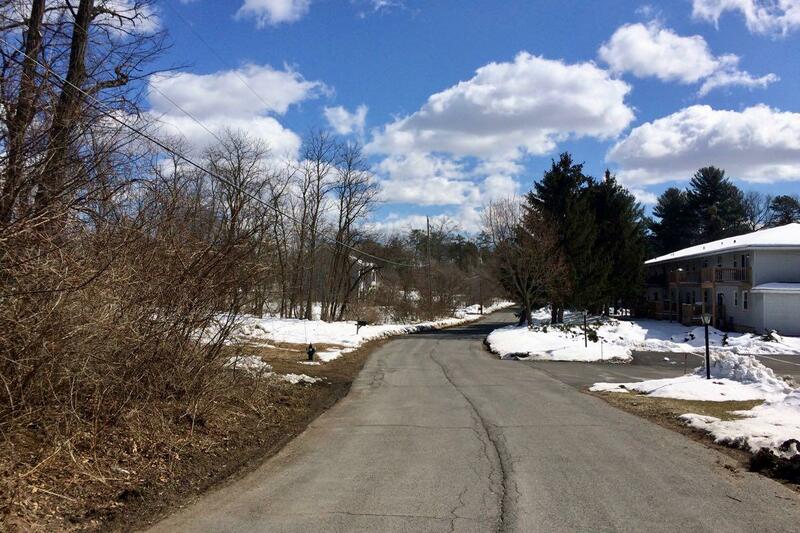 The land on which Birch Hill Road runs isn't deeded to anyone, according to Franchini. (She said it's not entirely clear how the street ended up not being owned by the city, but the roots of the situation probably stretch back to when the plots there were subdivided from an old estate.) So for the city to take the street over, it doesn't have to go through the process it would typically go through for acquiring private property. Albany's an old city full of these sorts of tangled remnants of the past -- sometimes it's unmapped sewers, other times overlapping streets and property lines. And sometimes it takes a while to unwind the knot. 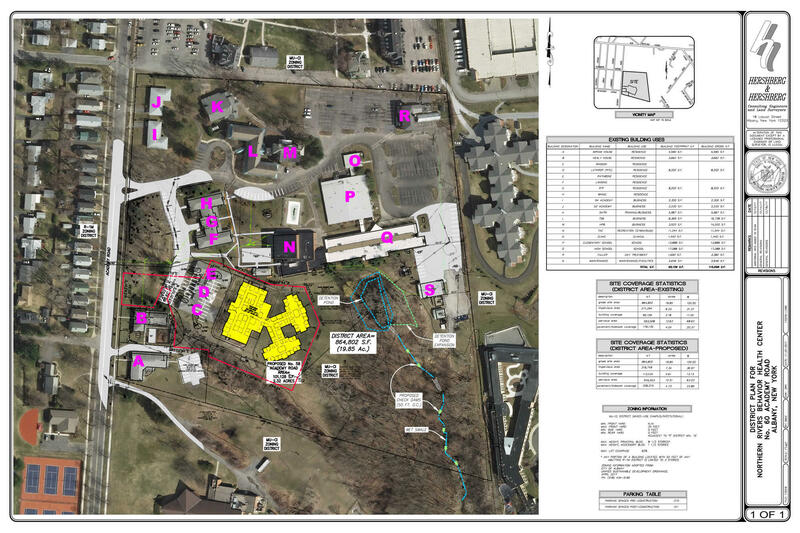 The proposal from Northern Rivers / Parsons Child and Family Center to build a new 25,674-square-foot office and residential building on its Academy Road campus -- and knock down a building it will no longer be using -- was back up before the board. Dan Hershberg was again repping the project. He provided a few updates on stormwater management and other issues. (Stormwater is really giving parking, traffic, and neighborhood character a run for popular planning board topic popularity.) Hershberg said the formal stormwater management plan hadn't yet been submitted to the water department, yet. Annals of sewer equipment: Hershberg also told the board the sanitary sewer for the project would include a grinder pump. The device keeps items that shouldn't be flushed (like rubber gloves) -- but sometimes do get sent down anyway -- from getting stuck in the sewer system by chewing them up. He said the devices are commonly installed on institutional buildings. The board unanimously granted demolition approval for the project. And it'll be back up before the board again for district plan approval. The proposal from Red-Kap Sales to partially demolish and rebuild the gas station on the north side of the Southern Blvd / Mt. Hope Drive intersection was back up. 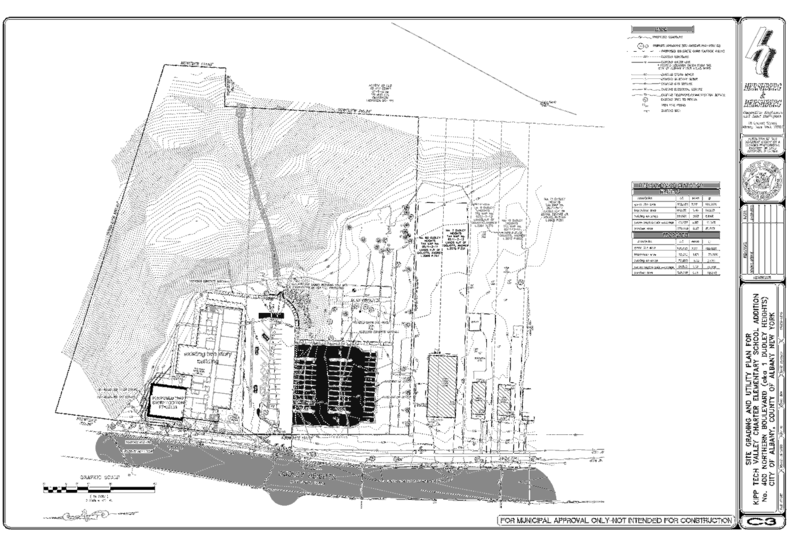 Engineer Frank Herba recapped some of the details, provided a few updates, and mentioned that the addition of a Dunkin' Donuts is expected to prompt a small uptick in customers at the site. Things were going along normally and it looked the board was moving toward taking a vote on demolition when Brad Glass, the city's deputy planning director, mentioned a late-arriving email from the Albany County Planning Board. (Because the project is on Route 9W, the county gets to weigh in.) There was some conferencing among city staff about the recommendations from the county planning board and some apparent uncertainty about the implications of them. Because the board had just three members present -- and some votes in situations involving the county planning board require a super majority -- the board put off any votes on this project. A proposal from Kipp Tech Valley Charter School to build an addition to its elementary school at 400 Northern Boulevard made its first appearance at a regular planning board meeting. The school is currently K-1 and it's process of adding a grade per year until it reaches K-4. (KIPP's middle school is across the street.) John Reilly, KIPP's board president, explained the number of students in the elementary school is expected to grown from 200 to 470 in 2021, and the addition will provide the needed room. The plan also calls for the demolition of four adjacent houses that KIPP already owns. Removing the houses will create space for 55 new parking space and bus circulation through the site. Dan Hershberg, repping the project, said the extra parking was necessary because parents must come in side to drop-off and pick-up their kids, and also because Saturday programming draws a large number of families. As mentioned, this was the project's first time up and it'll be back at least a few more times. The Albany County Land Bank's Amanda Wyckoff and Charlotte O'Connor were back at the planning board seeking demolition approval for a new group of properties: 308 First Street, 522 First Street, and 309 Second Street in West Hill. Wyckoff showed photos of the buildings -- all were in various states of significant disrepair and collapse. She said a few of the properties were potential candidates for the land bank's side lot program, in which adjacent property owners acquire vacant lots. The board had a few quick questions about how seeding (top soil and grass), fencing (sometimes, but not as a matter of course) on the newly-vacant lots, and street trees out front (usually not disturbed because they're city trees). The planning board unanimously granted demolition approval for all three properties. Not at all! If the existing homeowners own the road, some developer doesn't get to usurp their private property rights just because. Who knew that a report on a planning board meeting could be so interesting? I imagine if the property owners were made responsible for maintenance of their sections of Pine Ln and liable for any negligence on that part, it wouldn't take long for them to cede ownership to the city.